Bioretention basin in a high-density urban development. All new homes in NSW must meet BASIX, the Building Sustainability Index, which requires new homes to be water and energy efficient. All development applications must be accompanied by a BASIX certificate that addresses the capture and re-use of stormwater. New developments in the Sydney drinking water catchment must also meet the additional standard of a neutral or beneficial effect on water quality (NorBE). To achieve this higher water quality standard, landowners and developers will often need to use extra treatment measures than required by BASIX. This requirement is because of the potential of construction activities to contaminate our drinking water supplies. It is also because of the potential of any new developments to increase the amount of stormwater or wastewater generated on a property, which can also affect drinking water quality. 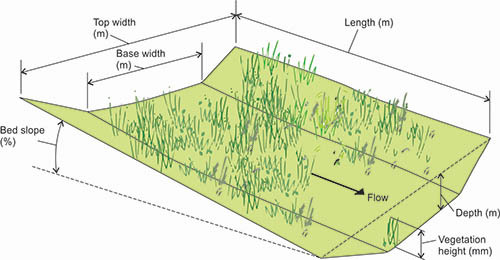 A perspective view of a swale as used in MUSIC. It is important to consult your local council in the planning stages of your development, to ensure your proposed design, and construction stormwater control measures, will have a NorBE on water quality and meet other requirements. Find out more on the development application process. WaterNSW has developed the Using MUSIC in Sydney's Drinking Water Catchments (PDF, 5305.17 KB) manual to assist consultants prepare MUSIC stormwater quality models to help achieve a neutral or beneficial effect on water quality for proposed urban and rural land use developments. See the climate zone key map for rainfall zones in your development area. The small scale stormwater quality model (S3QM) estimates stormwater pollutant generation and the performance of stormwater treatments from smaller, less complex proposed developments. WaterNSW accepts the use of this tool when estimating stormwater impacts for smaller developments of less than 2,500 square metres. See S3QM support for information on creating models, a user guide, and case study examples.